No matter where you look, it seems that QR codes are popping up everywhere. Shopping for real estate, looking at store ads, or reading a magazine, you are bound to find these interesting codes. Whether QR codes are fad or here to stay, their presence right now is strong. With this in mind, our elementary Instructional Technology Specialists were brainstorming ways to use QR codes in the elementary school...the library seemed like the perfect spot. All of our librarians had just received web cameras to use for Skype, so why not find another use for them and get more bang for our buck. Now that we had a focus, the question was: How could QR codes be an asset to the library? In Missouri, 4th, 5th, and 6th grade students have the opportunity to read the Mark Twain Award books. With that in mind, we recruited some librarians to make a book trailer for each book. Most of the librarians used Photostory to create the book trailers. The book trailers were loaded to Schooltube and a QR code was created for each schooltube video. With these codes affixed to the books with some book tape, students can now get access to their book's trailer. Students can come up to the web camera, open the QR Reader software, and hold the code up to the camera. The camera takes a picture and students get to view the book trailer. Hopefully it makes them want to read the book! Our goals for this project are bigger than just 12 book trailers. We hope students get energized by this and want to create book trailers for their favorite books. Maybe it is an incentive for reluctant readers to read more books and create a book trailer. This does not have to end with book trailers either. Students could create physical projects (posters, art, etc.) that can be photographed and uploaded to the web (and linked to a QR code). That is one of the great advantages to QR codes...you just need something with a URL. We hope teachers see this as an authentic product and encourage their students to do this instead of the dreaded book report. Over time, more and more books in the library could have their own book trailers, Prezi presentations, glogs, etc. Students would feel pride to know that their work is serving a purpose. So bottom line: If any project is put on the web, its URL can be turned into a QR code! Note: For the QR Reader, you must also download Adobe Air. Authentic products for an authentic audience create meaningful learning experiences. 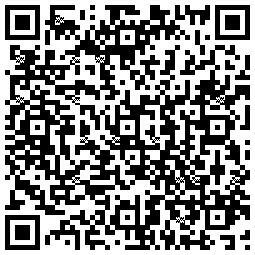 Android users can use the QR code directly linked to the application in the Android market. Google has also been good to use QR codes through Google's Local Business Directory, in order to promote business and themselves.